After sorting out the crafts last week, I didn't think that I was going to see the benefits of it until Top Ender, Big Boy and I decided to do some Christmas Crafts during Advent. Top Ender however had other ideas, and was in the crafts for her weekly homework task. The idea was, that the children were given some split pins and they needed to use them to create something creative. 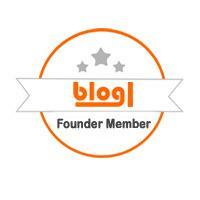 Top Ender had an idea that was so fantastic and I was so impressed by it that we decided to make a blog post about it. Top Ender decided to make a Christmas Countdown, and after making sure it was okay to use one of my large canvasses she set about designing how she wanted it to look. A few doodles later and a quick scour of the rest of the crafty bits that we have and she had her homework finished. It took about fifteen minutes, and that was including finding various items! Top Ender started, by drawing a circle around a bowl on the back of her canvas. 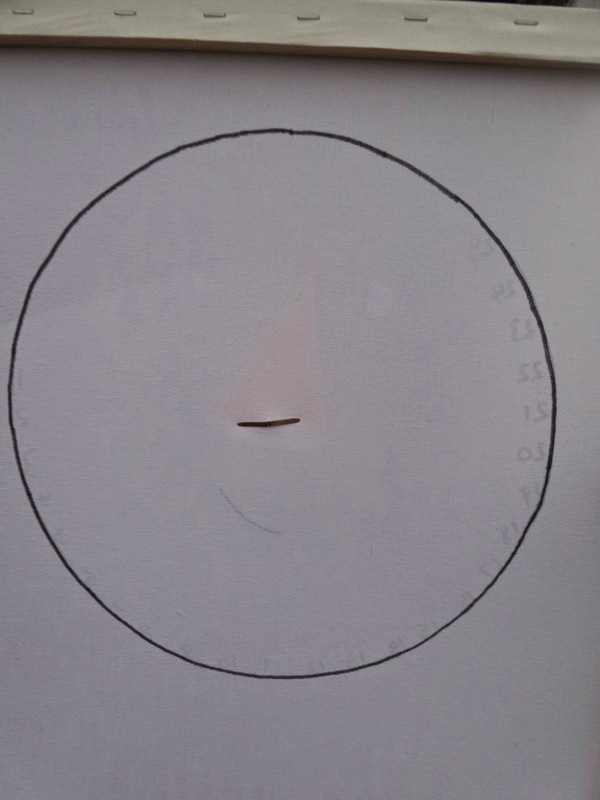 She wasn't sure if she would accidentally puncture the canvas, so she thought it better to start with a pencil on the back and then trace it round on the front. 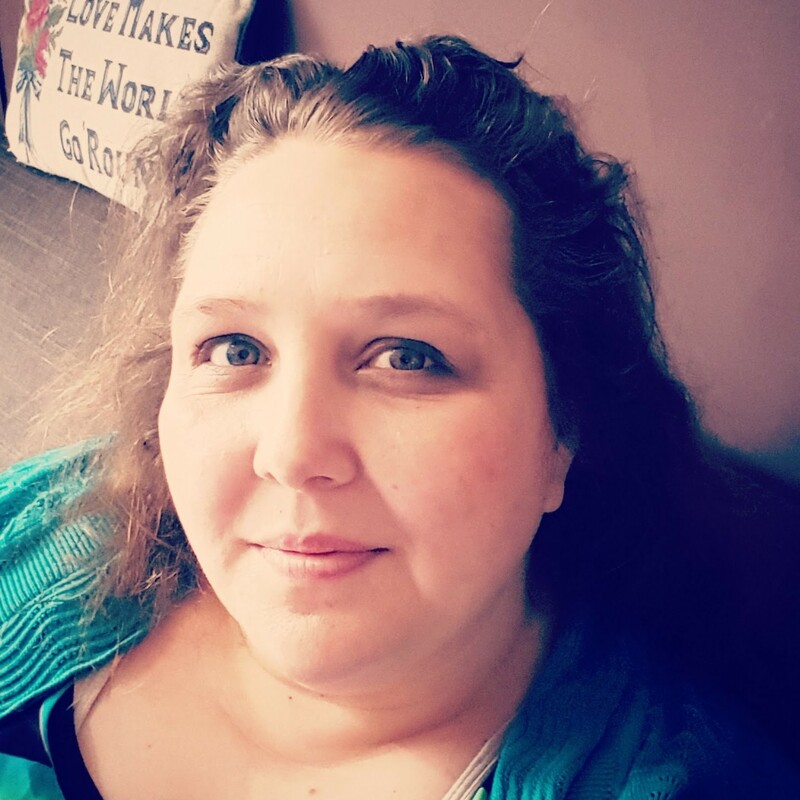 It turned out that she couldn't quite see the pencil line from the front of the canvas, so she went back over the pencil line with a marker to make it more visible. She then just traced the line on the back from the front of the canvas! I didn't take any pictures as Top Ender was doing this, because she was doing it alone! She was so secretive about her homework, I think in part she was worried that it wouldn't look as good as she hoped it would. Top Ender did come to me and ask for help making a carrot nose, I had a circle of orange paper and just folded the sides round to form a triangle, we figured that this would be useful, as it also pushed the nose forward a little and gave it a more 3D effect, which was what Top Ender was after. Top Ender then decided where she wanted the nose to pivot from and I taught her how to put a blob of blu-tac or play doh under the point and push the pin into the canvas. She felt much more at ease when we did this, and less like she was going to rip the canvas. 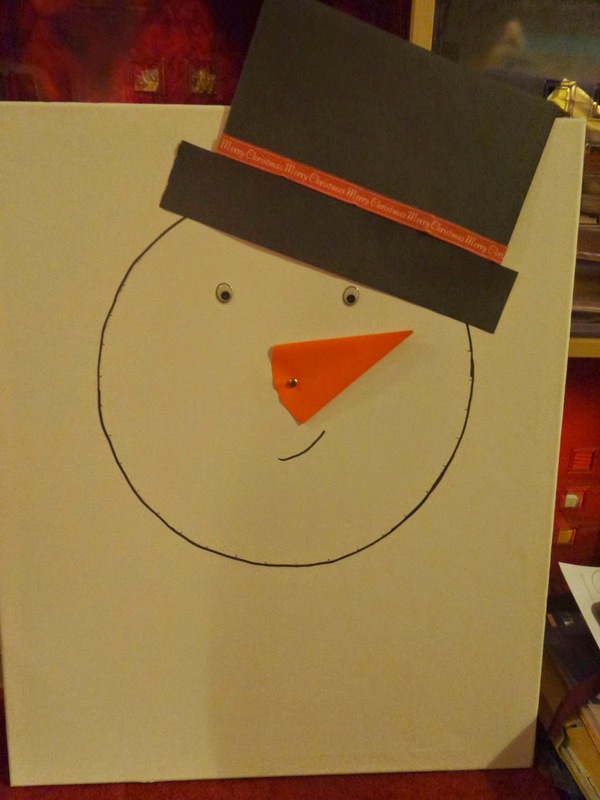 Some stick on Googly eyes, and a little cheeky grin were added and Top Ender thought her Snowman was looking pretty good! Top Ender then made a hat from a sheet of black paper. She cut a strip off one side and folded the main part of the hat to the right size before sticking the two parts of the hat to the canvas using sticky dots. She had picked out some ribbon from her Harumika craft box to use, but I found some Merry Christmas ribbon, that I thought might have been more festive and so after she trimmed it to the right size, she stuck that to the hat as the ribbon band. We had a big debate, to if the snowman should remain a floating head (Top Ender's choice) or if she should add a body, or a scarf to make him less giant floaty head like. Top Ender decided as it was her homework, her choice should stand and if I wanted to make one myself, I could do what I liked. She had a valid point. 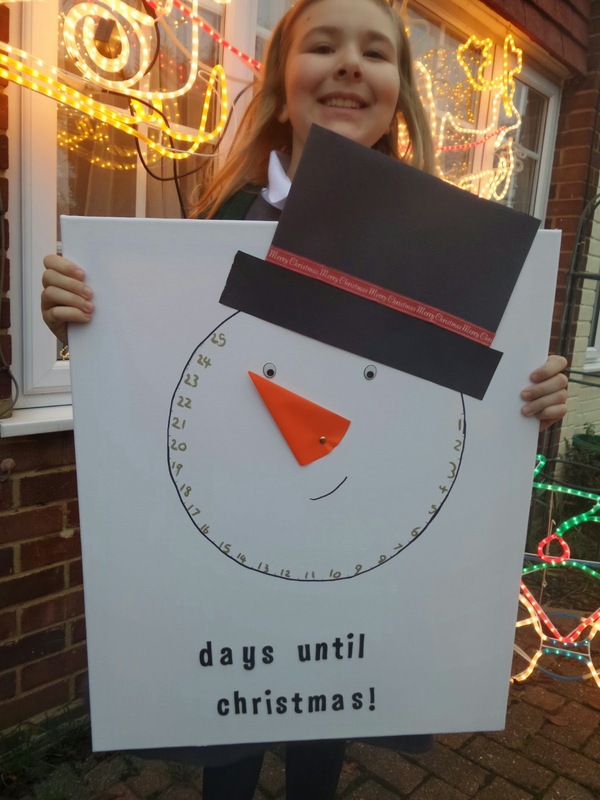 The last two steps were to add the actual countdown to the snowmans face and to add some stick on chipboard letters to the bottom of the canvas. 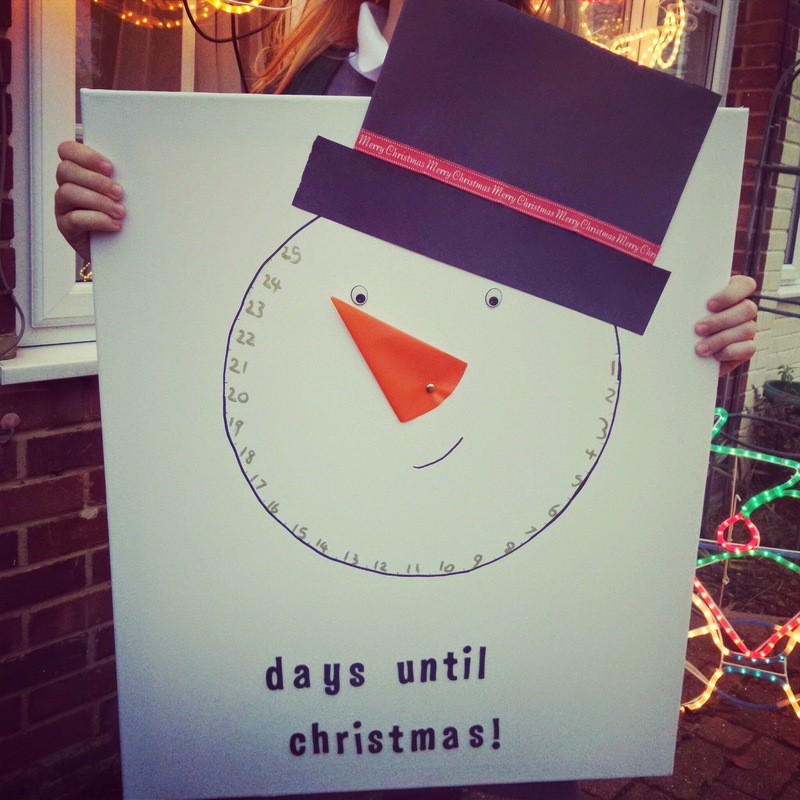 The letters, were leftover from a Christmas gift that Daddy made me a few years ago and Top Ender pondered for ages over what she should put, she decided that "days until Christmas" was the best option and I have to agree, it looked fab! Top Ender worked out how to divide up the lower part of the face to put 25 numbers on then after writing out her numbers lightly in pencil, she went over in a metallic gold pen. I honestly can't believe how great it turned out and Top Ender was rightly proud of her creation. What do you think of Top Ender's craft? I think that it might even be better than our Breast Pad Snowmen!